In marked contrast to literary, historical and cultural studies, there has been a limited engagement with the concepts and politics of trauma by political science and peacebuilding research. 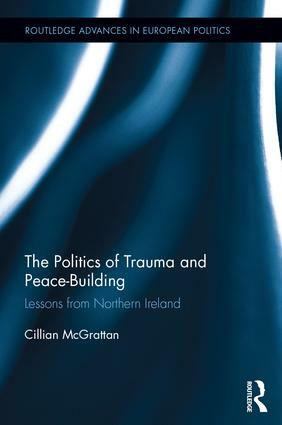 This book explores the debate on trauma and peacebuilding and presents the challenges for democratization that the politics of trauma present in transitional periods. It demonstrates how ideas about reconciliation are filtered through ideological lenses and become new ways of articulating communal and ethno-nationalist sentiments. Drawing on the work of Jacques Rancière and Iris Marion Young and with specific reference to the Northern Irish transition, it argues for a shift in focus from the representation of trauma towards its reception and calls for a more substantive approach to the study of democracy and post-conflict peacebuilding. This text will be of interest to scholars and students of peace and conflict studies, ethnic and nationalism studies, transitional justice studies, gender studies, Irish politics, nationalism and ethnicity. Cillian McGrattan is Lecturer in Politics and a member of the Institute for Research in the Social Sciences at the University of Ulster.